The Franklin Soccer School was founded by two avid soccer people -- Kevin Sayward and Rich Frongillo -- to provide opportunity for individuals to improve their soccer abilities. 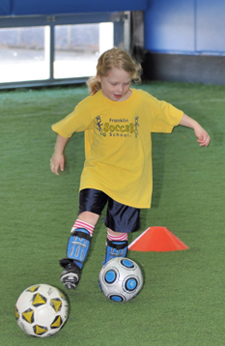 Students who train with FSS are encouraged to focus on fundamental techniques to construct a solid foundation for enjoying the beautiful game of soccer. Every individual will succeed with careful attention to detail and an interest in improvement. offered in a fun and energetic environment. will offer a series of training programs geared toward individuals interested in improving their soccer abilities through focused attention to basic skills.